Q: Christmas is just around the corner. Lately I've received so many blessing messages from my friends and clients that my Sony inbox is kind of jammed. I really want to reply them one by one, but I don't have a clue about where to start. I heard that there are some programs that can send messages on computer instead of cell phone. Is it useful? Which one is better? I could really use some advice. Thanks a lot and Merry Christmas! Now Christmas is coming, many of us begin to send presents to our friends and send blessing SMS as well. However, when your cell phone is filled with those messages, you may be perplexed with how to reply them in short time. For example, when you use a Sony Xperia cell phone, you will use a built-in program to manage your data known as Sony Ericsson PC Suite. But it's known to all that this manager could only transfer or delete the files. What if you want to do further steps like editting the data? At this moment, you may turn to alternative software to do such things. To save your time seeking for alternatives to Sony Ericsson PC Suite, I'm going to recommend a powerful and useful alternative software for you to meet the demands. And this program will definitly be your best choice. Here is the reliable software: MobiKin Sony Ericsson PC Suite Alternative (Windows or Mac). With it, you can not only transfer all the messages and save them in a CSV format file to the computer, but you can also reply the messages to those who send you blessing SMS by just a few clicks. Furthermore, the messages can be printed out after you export them to your PC if you want to keep them as memorials. Besides, other data like video, contacts, music and photos can also be managed by the software systematically. 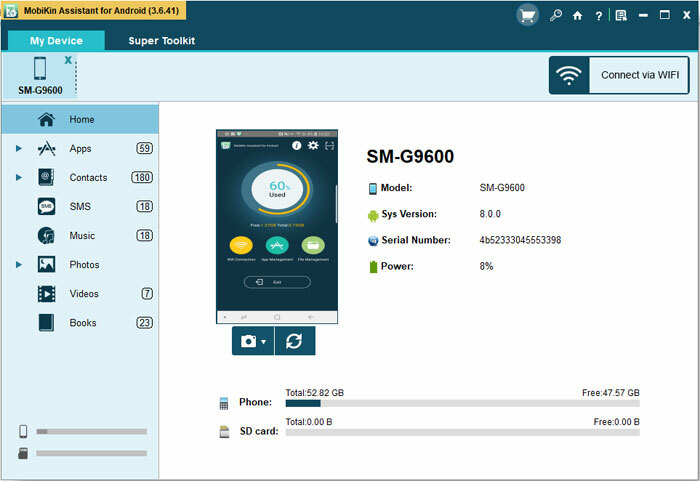 Most important of all, its wide range of compatibilty allows all types of Android cell phone to function perfectly such as Samsung, Motorola, HTC, Huawei and ZTE, etc. So seize the opportunity to get the powerful and efficient software! In the very beginning, you need to download the alternative software to Sony PC Suite on your computer. Choose the right version that matches you computer system. The options are as follows. First, link your Sony Xperia to your PC via USB cable. It will automatically identify your device smoothly if you have managed to install the USB driver before. If it fails to recognize your cell phone, then you need to follow the steps below to enable USB debugging first. 3) For Android 4.2 or newer: Enter "Settings" < Click "About Phone" < Tap "Build number" for several times until getting a note "You are under developer mode" < Back to "Settings" < Hit "Developer options" < Check "USB debugging". When you finish installing the USB driver, click "USB debugging opened" and "Next" at the bottom of the poped up window above and then you will see the main interface as follows. On the interface lies the basic parameter of your cell phone like model, system version, power, and storage, etc. When the detection of your Sony cell phone is done, your data will be classified in clear categories on top of the menu. Now let's take an example of the category "Contacts" to explain how to use this software. Select "Contacts" and continue to choose "All SMS" in the left column, then you can preview the detailed conversations in this software. Click "Backup SMS" button to export all SMS messages on your Sony Ericsson to PC. Apart from the backup function, you can also send messages with this software on computer conveniently. Note: In addition to the managements about "Contacts", you can also edit other files on your Sony Xperia such as apps, music, photo, video, book and tasks. To be honest, I can't find any other better alternatives to Sony Ericsson PC Suite than this software. So trust me and you will never be disappointed with the great Sony PC Suite alternative.